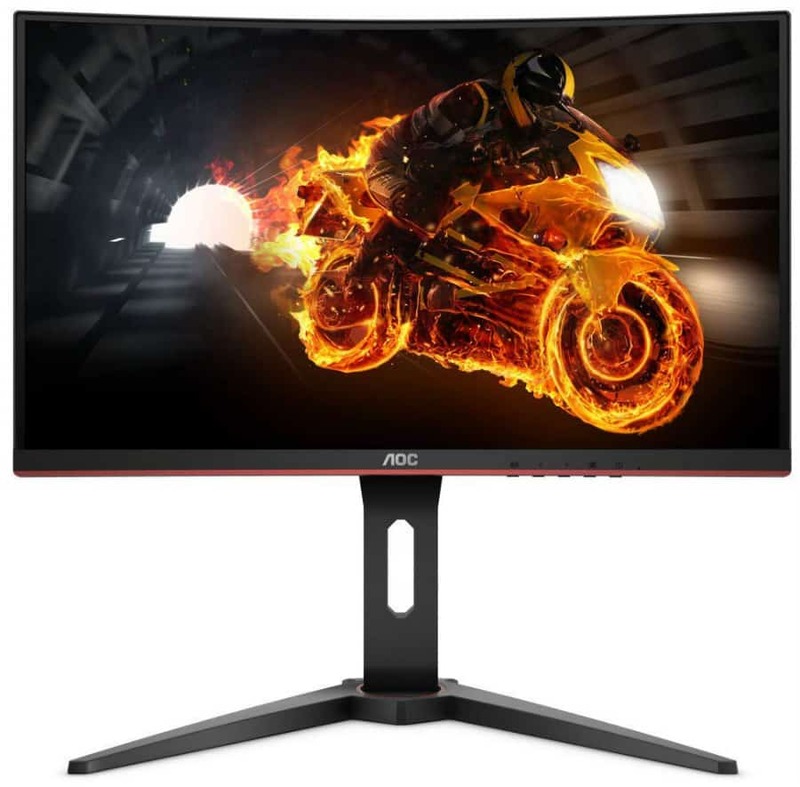 The AOC C27G1 provides a 144Hz curved screen with decent specs at a reasonable price point for gamers who want immersion and resposiveness in one product. This model is targeting a wider audience due to its price tag along with the easy to run 1080p resolution. The AOC C27G1 already has the advantage in design when compared to similar offerings, but can it’s performance breach expectations? The AOC C27G1 sports an improved aesthetic scheme of the brand’s previous models such as the AOC G2460PF. The chassis has a matte black finish with red streaks in spots on the front and back of the chassis. The design looks more appropriate for modern gamers, but our favorite characteristic is the bezel-free screen which is easy on the eyes. The rear chassis looks cleaner and refined, and the X-oriented red accent seems cool without being too overbearing. We love sleek-looking products like the AOC C27G1 because the appearance is more comfortable to live with. Build quality is, as expected, superb since there are no creaks or uneven seams on the whole build. 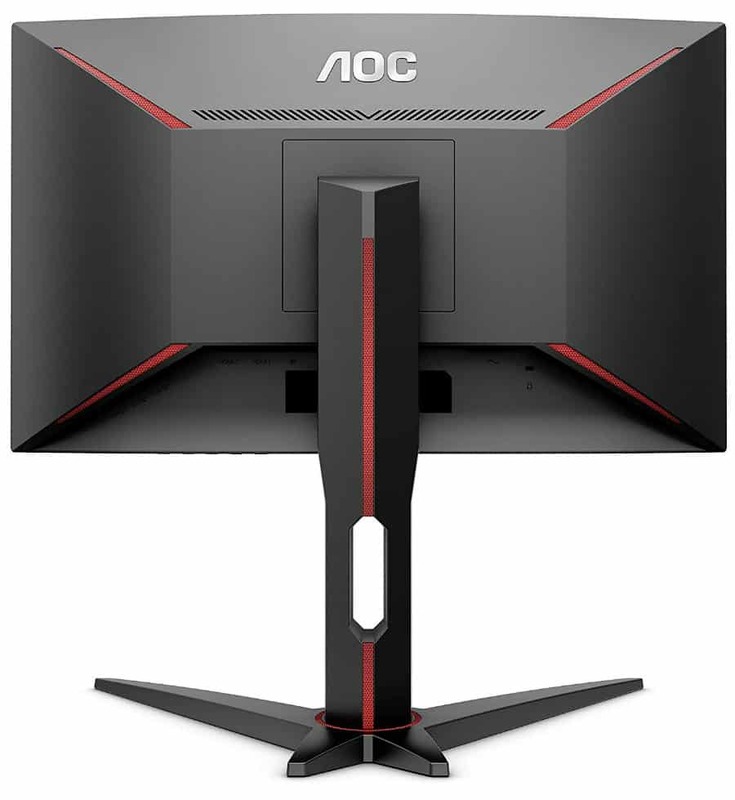 The AOC C27G1 is a curved gaming monitor as denoted by the letter C in the model name. 27 inches is the right size to start with if you are after the immersive value of this form-factor and as you go bigger, the more engrossing it will get. However, this model’s size feels just about right and shouldn’t intrude too much on desks with limited spaces. The AOC C27G1’s most significant advantage to the Acer ED273 is its fully ergonomic stand which will allow you to tilt, swivel, and adjust the height of the monitor. The display doesn’t rotate since it’s unnecessary for curved screens. Thankfully, you can opt for VESA mounts if you insist on viewing this device in portrait mode. The connectivity layout for the AOC C27G1 is pretty straightforward because it only includes DisplayPort 1.2, HDMI 1.4, and a VGA connector for older machines. There are no extras such as speakers or USB receptacles, but the target audience will rarely miss these in practice. AOC might have cut a few corners to keep pricing low, but we think it’s within reasonable limits. The AOC C27G1 sports a 27-inch curved VA panel with a 1920 x 1080 resolution, 144Hz refresh rate, and 1ms response time. Contrast is specified at an elevated 3000:1, but the 250cd/m2 backlight could use an upgrade. The immediately noticeable characteristic of a full HD monitor at this size is the visible pixels if you sit too close. The screen may not look as sharp as we’d like, but small objects are easily visible than on a high-resolution display. This kind of image output is preferred by E-Sports gamers who require every advantage in games like CS:GO. The AOC C27G1’s color output isn’t as impressive as we hoped it would be since it comes with a supposedly more vibrant VA panel. sRGB coverage can only reach 98% at default, with little to no improvements even after calibrating with a Spyder Elite Pro. However, you do get excellent color accuracy right out of the box with a DeltaE average of 1.5. You can tighten the color consistency to DE 1.1 with a colorimeter, but it isn’t worth the effort since the improvements are almost unnoticeable. The AOC C27G1’s screen looks balanced and well-saturated for all types of use save for professional applications. The contrast ratio doesn’t reach the specified 3000:1, but it can achieve 2000:1 on average which an already excellent score. Just remember to lower brightness to 50% or less and set the Gamma setting to 2.1 for good color definition and depth. Our test unit of the AOC C27G1 also impressed us when it came to panel uniformity. The panel looked balanced with minor deviations from the ideal D65 standard, save for the upper corners which had errors. This flaw is expected from curved monitors, although it’s within livable limits. The brightness uniformity is also within acceptable limits resulting in a screen that looks evenly illuminated. Setting the brightness too higher will add a warm tone to the color, so we recommend staying below 50%. The AOC C27G1 is also able to reach its specified brightness with a max output of 248cd/m2, but we think a higher rating is more ideal. The AOC C27G1 handles motion quite well, although the limitations of VA technology are still present. The monitor doesn’t blur too often in fast-paced games such as PUBG or Overwatch, but there will be a few smudges here and there. We recommend opting for a TN panel if you are visually sensitive to these flaws or set a good balance for the pixel overdrive feature in the OSD. The AOC C27G1 is compatible with FreeSync at 48Hz to 144Hz, although you will need an AMD GPU to utilize it. Input lag for the monitor is limited to 6ms with FreeSync active. You can boost this to 4ms with the Low Input Lag feature of the product, but it will lock out the variable refresh rate solution. The AOC C27G1 is a decent gaming monitor that’s responsive and well-equipped to perform it its category. The curved screen feels just right, although the resolution looks softer at this size. The vibrancy of the screen is a bit disappointing, but excellent out of the box accuracy helped us forget that limitation. Get the AOC C27G1 If you want a monitor that handles immersive and fast-paced gaming with aplomb. The monitor’s characteristics make it flexible for any type of gaming, but its budget-oriented design may have hampered some of its imaging qualities. But we can say that this gaming monitor is well-worth its price since the pros outweigh will outweigh the cons for its primary use.